1. This dog who really just wants his ball. 2. And this one who has just about given up. 3. This little lady who will pretend like nothing is wrong, but honestly, the fence won. 4. These dogs who are blinded by their own anger. 5. These puppies who just discovered a whole new world. 6. This guy who is still trying to figure out what it all means. 7. This giant who clearly doesn't understand just how big and able to jump over fences he is. 8. And this pup who really thought she was bigger. 9. This shiba who really didn't think things through. 10. This dog who just never understood the difference between fences and everything else. 11. 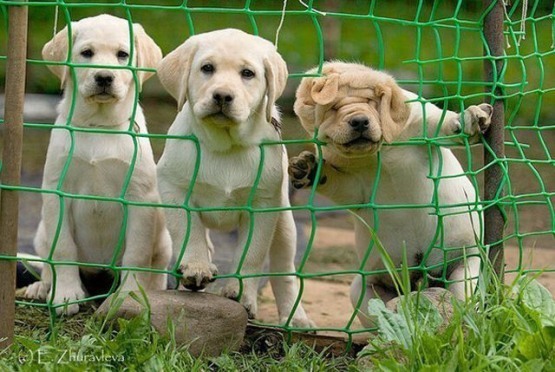 And this puppy who is thinking it was a lot easier going in than getting back out. 12. This dog who just wants to say hello without any hindrances. 13. And finally, this fellow who doesn't understand this fence, but doesn't really mind it either.